I took my Raven to Bicycle Workshop finally last Saturday for a quick tune and (more importantly) to get the top of the fork trimmed off. It looks much tidier now! I've also put on a Klik Fix map holder, which is great - it obscures the cyclometer, which doesn't cause any trouble because it isn't working anyway! 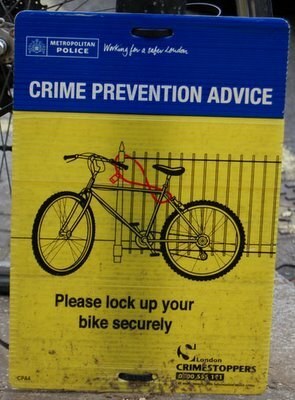 We saw this sign affixed to the cycle racks in Cavendish Square, behind John Lewis. Seems more like the work of a resourceful criminal looking for easy pickings than legitimate advice from the police! I've written up a small report on the ride I "led" to Waltham Abbey on December 18th on the Camden Cyclists website. No, not the residents of the monkey house! 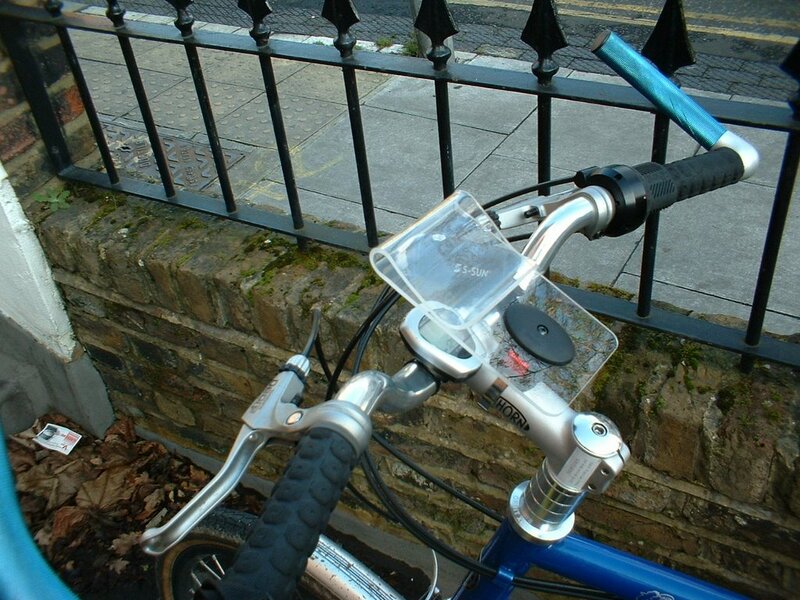 As we were on our way out, another couple cycled in with their 17-month-old perched in another Bobike seat just like ours, complete with windscreen! I'd passed this couple with thier baby on the canal before, but that would have been a highly inconvenient time to talk. We had a quick chat this time, though. 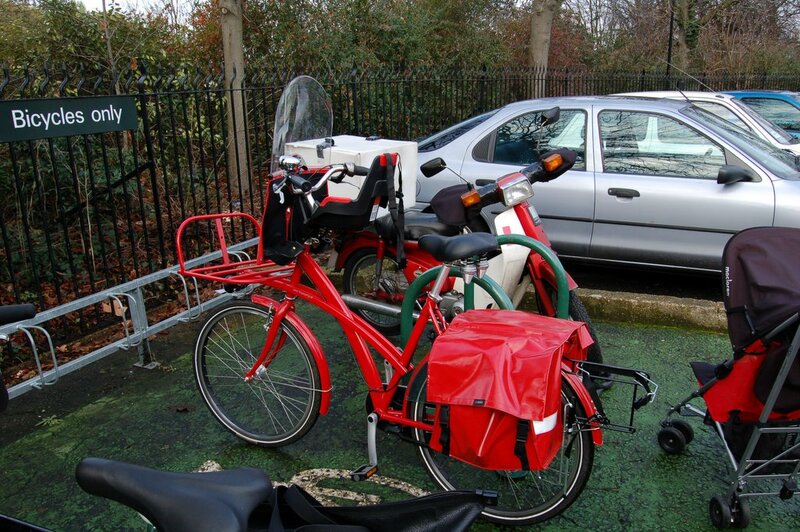 The Bobike Mini was mounted on a Dutch Filipak from a shop in the Netherlands called 't Mannetje. I had a look at the website, and there's some really interesting stuff there - lots of exotic but practical city and cargo bikes. I told the chap at the zoo we're expecting another baby, and he recommended the t'Mannetje Filiduo for us. Interesting, but but I don't know about having TWO kids behind (let alone one), and the next one will be a bit young for that sort of thing anyway. I wish we'd managed to exchange details, but I'm sure we'll run into them again - that bike is hard to miss! I've been looking forward to this since before Gem was even conceived. When I saw the Like-a-Bike a few years back, I began anticipating the day when I'd have a child to buy one for, and that day has finally arrived! We picked out the special edition Puffin from Velorution and Kim ordered over the phone. (It has a cute striped saddle, and it comes with a little puffin to ride along!) We had thought about getting the propstand with it, but Andrea assured us that we didn't need one, but we did go for a red matching saddle bag that drapes over the crossbar (of sorts). I'd hoped to be able to pick it up myself, but work plus holiday pandemonium scuppered that plan. 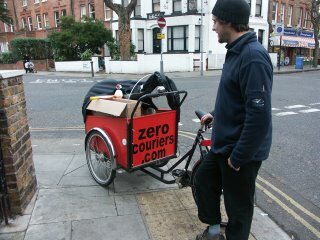 Instead, Velorution arranged to have it delivered by Zero Couriers on a three-wheeled Christiania, which attracted lots of attention by passers by when it arrived. We kept it under wraps until Christmas morning. Gem was delighted with it of course! She's a bit small as yet, only able to touch both her tippitoes at once. She loves being pushed along, though, and she has lots of fun stuffing various things (the puffin included) into the saddle bags. We went out on Boxing Day for a trial run and she had a great time. We'll head out again once the weather improves a bit, or when we've got time to head to Kilburn Grange where she can have a proper go. 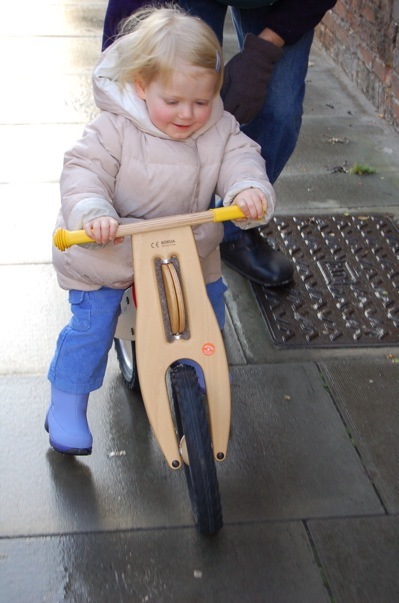 This is the start, though - her own custom-built Thorn just like daddy's is only around the corner! Seems like ages since I last posted... well, that's the holidays for you. Since my last post, I had a lovely ride up to Waltham Abbey along the canals with a nice chap I met through the CCC - but nothing really notable to report apart from a nice pub lunch. Visiting relatives and brutal colds all round then scuppered any chance of good cycling for a while. I did do lots of biking around for domestic stuff - picking up the Xmas turkey, seeking out proper marshmallows at the various American shops in NW London, etc. And with the closure of the Jubilee Line between Xmas & New Years (for train lengthening) and the Underground strike over New Year's, I've been all the more thankful for a reliable means of transport!